Hi there! Yesterday my children went back to school so now it’s time for me to get back into a more constructed routine – boo! 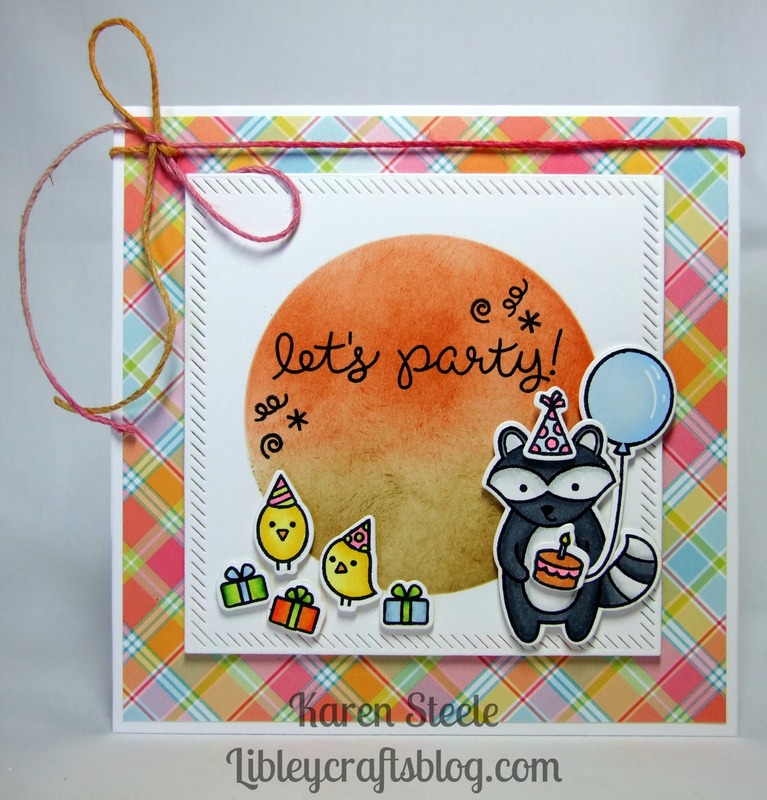 Today I’m sharing this card that I made using Lawn Fawn’s Party Animal and Holiday Party Animal stamps and dies. I’ve said it before and I’ll say it again – I LOVE Lawn Fawn! Their little critters are so cute! I coloured these little fellas using my Spectrum Noirs and used the following supplies:’Perfectly Plaid Paper’ – Lawn Fawn, MFT Die-namics – Inside and Outside Diagnol Stitched Square Die, Lawn Fawn Pink Lemonade twine, Big ‘n’ Spicy inkpad – Spice, a Tuxedo Black Memento inkpad and a white gel pen. I made a mask and used a blending tool to create the circle in the middle as a backdrop to the characters and popped some foam pads on the back of them for dimension. This card is a party waiting to happen! Gorgeous. Hope day one back at school was ok! Thank you Gill! Yes, day one back at school went well – thanks for asking! They both actually enjoyed it! Long may it continue! Karen, this card s AWESOME!!! Love the plaid paper and the background you made is amazing!!! Live every single thing about it!!! Awww…super Cute!! 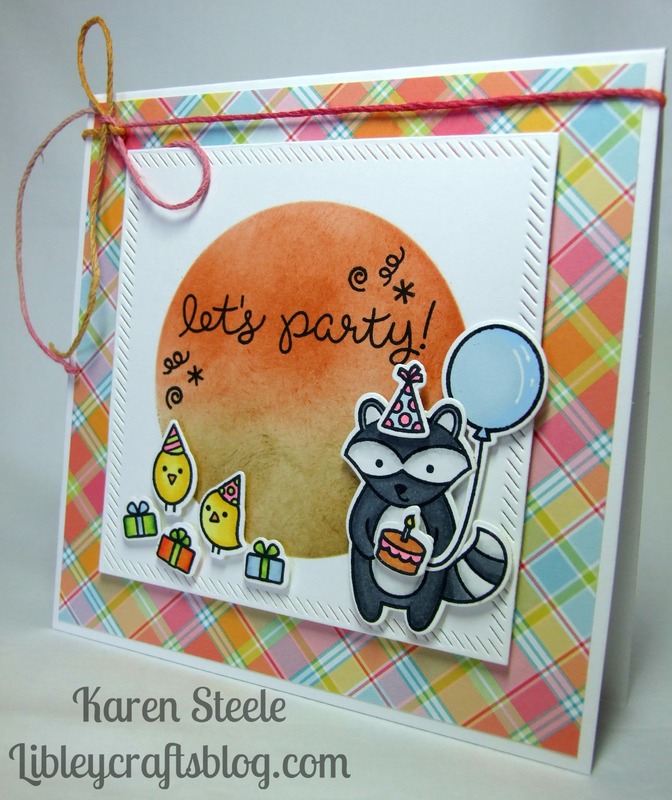 I love Lawn Fawn and I love this card, Karen! Fab background and the little critters are colored perfectly!! They’re so cute these little animals. I love Lawn Fawn too, so many sets I’d love to get my hands on. I do however need a bit more inspiration and ideas on how to use smallish stamps. The inked circle helps them not looking ‘lost’ on this card, great idea. These are darling critters for sure…really not wanting to see cute cards like this because I am trying very hard not to get any new stamps this month. This is so cute tho, Karen, that you are tempting me without mercy. Love it! Super cute, Karen! Love the little scene you created! I love Lawn Fawn critters too.